Blog updated 2-3 times a month. I am excited to be participating in a new blog hop initiated by author A.E. Radley, along with a host of other lesfic authors. I can’t wait to see what topics this blog hop throws up. The first one is Writing my first novel. A great first topic to break the ice with. Plus, it really made me go back and think about what it was like writing my first novel, which one it actually was and how it all came about. My very first novel, written and published, was Crush, which became the first book in the Girls of Summer series. It didn’t start out as a novel though. It actually started out as a novella, written only from Tess’s point of view. My intention with the Girls of Summer books was to make them short and sweet, and in print, on the smaller size. Something you could put in your back pocket and carry with you. 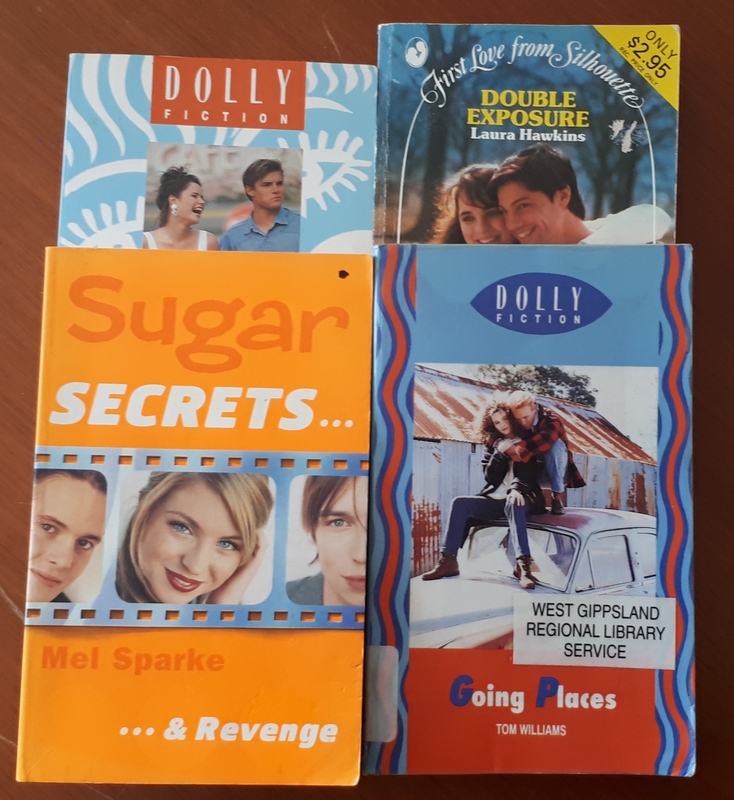 A couple of my Dolly and First Love books – I read these when I was 12-14. The Dolly romances and Silhouette First Loves books I read in my youth (now I’m showing my age) were small books that were easy to read. I ploughed through them while sitting in the stacks in my school library (I never actually borrowed them – I guess I didn’t want them on my library record for some reason). I wanted to emulate those books from my youth, but where girls fall for girls. So, the first iteration of Crush was a 21,000-word novella about Tess meeting and falling for the enigmatic Maddie. I loved that book so much, and so did my first readers. I sent it off to a publisher, who got back to me within a few weeks (totally unexpected as they normally take a few months) and said they loved the book and the concept of the Girls of Summer series. They then dangled the carrot for getting the book into print – if I wanted my book to become a real, live paperback instead of just an ebook, I’d have to increase the word count to their minimum print requirement, which at the time was 40,000 words. As you can imagine, that was a HUGE ask. It meant doubling the word count and reworking the story entirely. After long discussions with my first readers, editor and wife, I decided to at least attempt to increase the word count and see what happened. After all, a lot of young adult readers still buy their books in print format, rather than ebooks, so I’d be missing a big chunk of readers if I didn’t get it into print. And what was the absolute easiest way to double the word count? To tell the other side of the story, of course. So I set about writing Maddie’s side of the story and alternated it with Tess’s, which gave me some great new fun scenes and a better insight into the story overall. There were a LOT of changes (some of the early scenes ended up closer to the end of the book, and some of the later scenes were brought forward, and some scenes I changed from Tess telling them to Maddie), but in the end, I have to say that adding Maddie’s side of the story, while it proved to be a lot of hard work, made it so much better. After some editing passes to check for continuity (always a major problem with such a huge rewrite), I sent it back off to the publisher with high hopes and waited for them to reply. And in the end, a couple of days before Christmas, I got the rejection I expected when I first submitted it. As you can imagine, after getting such great comments the first time around, I was totally unprepared for them to reject the second iteration. I have no idea why that happened, but it totally shook me. I spent a few weeks recovering from it and trying to work out what I wanted to do. I knew the story was a lot stronger for the new edits and editions and I struggled with that rejection after putting in so much hard work (at the publisher’s request). In the end, my wife sat me down and made me realise that my intention was to self-publish my books in the first place and that that was still an option. So that’s what I did. I picked myself up off the floor, went through another round of edits, organised the first cover, and learned how to format ebooks and print books and published Crush myself. And although I sometimes wonder what would have happened had that book been either accepted as it was in its novella form, or picked up after doubling the word count, I wouldn’t change a thing. I still get to hear from readers of that book (and the others in the series), regardless of how the book made it into the world. And I still get to write what I love. It’s bloody hard work doing most of it yourself, but I wouldn’t have it any other way. Read how Barbara Winkes’ first NaNoWriMo project became a published novel, and a standalone story turned into seasons of love. Barbara Winkes is the author of 20+ lesfic titles, including the Carpenter/Harding thriller series. She lives in Québec, Canada, with her wife. You can read about her first novel here. Want to be proud to be an Aussie cricket fan? Start watching the women. Get a free short story! Brisbane Pride 2018 is almost here! SR Silcox is the author of the Girls of Summer romance series for lesbian teens, and Alice Henderson series about girls who play cricket.